In the formidable struggle to reduce the damage caused by natural disasters in Latin America and the Caribbean, certain areas and sectors are especially relevant given the essential nature of the services they provide. Drinking water systems are one such priority. This publication focuses on natural disaster mitigation in rural water supply systems, which have different characteristics and organization schemes from those in urban areas. The effects of natural hazards on water systems - physical damage, chaos, disruption of services, economic losses - are a real threat to the development and health of the affected populations. Mitigation measures are a necessity and, in many cases, an opportunity for sustainable human development. 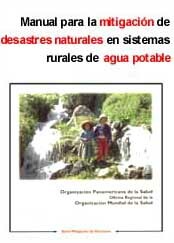 Part One describes the general characteristics of rural water supply systems, the most common natural hazards in Latin America and the Caribbean, and their impact on those systems. Part Two outlines a vulnerability assessment method and shows how to apply it to water supply systems. Finally, Part Three illustrates this approach with a successful case history from a rural community in Ecuador's Andean region. This publication strives to serve the needs of technical and administrative personnel in charge of managing and operating water systems in rural areas.